The artistic structure of the Binsar Mahadev Temple and its deity Lord Shiva both adds positive vibes to our mind and soul. A beautiful stream flowing close to the Binsar Mahadev Temple adds amazement to the natural beauteousness of this sacred place. 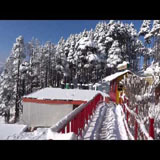 Binsar Mahadev Temple is situated amidst beautiful pine and deodar trees. 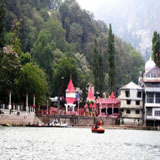 Apart from the temple an ashram, Binsar Mahadev also has lovely cedar forest surroundings.